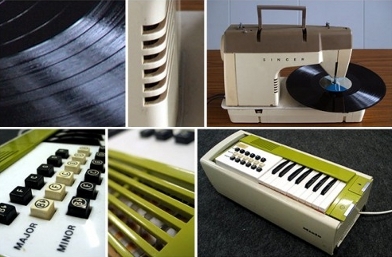 Another example of contemporary artists making good on Erik Satie’s idea of furniture music. More on de Bel at his website, danos.nl. Found via everydaylistening.com, which links to audio of the Vacumonium. Sacks takes issue with what he describes as Shields’s lack of interest in “any artifice that is not outspokenly aware of its artificiality.” Yet he fails to recognize the artificiality, let alone the humor, inherent in the book’s packaging, which wraps the cover in blurbs from various writers. Sacks seems to think he’s uncovered some sort of logrolling scandal (“Of the 14 blurbers, excerpts from work by fully half of them appear in the book itself, meaning that these esteemed authors are in effect heaping praise on themselves”), and in the process misses out on how the exaggerated presence of those blurbs on the cover is intended to draw attention to them — and to provide a model for what is inside. 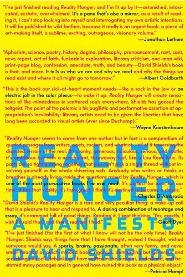 Most prominent among the book’s blurbers is Jonathan Lethem, who produced an essay-length riff along the lines of Shields’s Reality Hunger back in the February 2007 issue of the magazine Harper’s. Titled “The Ecstasy of Influence,” it is built almost entirely from pre-existing text, yet reads as a fully formed work. Shields’s book, by contrast, is a string of loosely connected fragments, sort of like the book-length equivalent of a Tumblr blog. It’s an ars poetica for a burgeoning group of interrelated but unconnected artists who, living in an unbearably artificial world, are breaking ever larger chunks of quote reality into their work. I don’t feel any of the guilt normally attached to quote plagiarism, which seems to me organically connected to creativity itself. The history of art is the history of appropriation. All art is theft. And so much of the laws that we have now protect the lawyers and hamstring the artists. I couldn’t help but hear — and, subsequently, after transcribing them, to then read — those uses of the word “quote” as an object of the sentences, rather than simply as verbal accentuation meant to highlight the words that immediately follow them, the spoken-punctuation equivalent to finger-quotes. For in Shields world, which is to say our own, “quote reality” is the reality that is constructed from pre-existing material. And “quote plagiarism” is the act of consciously utilizing chunks of material that already stand on their own, be they written phrases, or musical riffs, or image details. It’s worth noting that those two chunks of what Shields says appear in immediate succession in the video, and when yoked together serve as a single statement, but they are clearly (at least in the video) sourced from different events. Sacks’s review at wsj.com. More on Shields at davidshields.com. His book Remote (1996) was a prescient reflection on an information-mediated existence, published just before the Internet made that a widespread reality. Remote was published the year after B.W. Powe’s superb Outage: A Journey into Electric City, and I recommend reading them in tandem. Lethem’s essay “The Ecstasy of Influence” is at harpers.org. Update March 16, 2010: In his Sunday New York Times Book Review essay on Shields’s Reality Hunger on March 14, Luc Sante has a very different take on the book than did the Wall Street Journal’s Sacks. In the piece, Sante weighs in quite favorably, makes note of the Lethem connection, and draws the comparison to the role of appropriation in music — going even a step further, to touch on the aesthetic value of the fissures inherent in sampling (electronic fans, note the use of the word “glitch”), rather than merely focusing on the collage-like aspect of art-by-accrual. So what constitutes reality, then, as it affects culture? It can be as simple as a glitch, an interruption, a dropped beat, a foreign object that suddenly intrudes. Hence the potency of sampling in popular music, which forces open the space between the vocal and instrumental components. It is also a form of collage, which edits, alters and reapportions cultural commodities according to need or desire. Reality is a landscape that includes unreal features; being true to reality involves a certain amount of wavering between real and unreal. Likewise originality, if there can ever be any such thing, will inevitably entail a quantity of borrowing, conscious and otherwise. Full review (“The Fiction of Memory”) at nytimes.com. Dutch electronica trio Noisia managed to get Amon Tobin to remix a single from their forthcoming album, and it’s available for free download through March 8. The song is titled “Machine Gun,” the album Split the Atom. Tobin, true to form, extracts spare elements from the original and refashions them into his own piece — in the process, he takes the original and makes it considerably more abstract, largely ditching the club-friendly beat, and along with it various pop flourishes. His revision is also about half a minute longer that the song from which it’s derived. Noisia’s “Machine Gun” sounds a bit like if Daft Punk did the theme song for a James Bond movie. I can’t link to streaming audio of Tobin’s expert reassembly, because you have to go through this whole registration rigmarole to get the MP3, but it’s worth it (in part because the registration process allows you to opt out of future emails). The track’s online through March 8 at noisia.nl/free-download. Noisia are Nik Roos, Martijn van Sonderen, and Thijs de Vlieger; more on them and the free MP3 at noisia.nl. More on Tobin at amontobin.com. “Nicely ominous” — perhaps no other phrase can so well sum up the conflicting emotional effects of a well-crafted drone. Those words were part of a comment a few days ago, responding to a track by Hoist at soundcloud.com/hoist. Appropriately titled “Bleakscape,” the track is a lightly meandering, slowly circulating drone that doesn’t so much progress linearly as seap outward as time progresses. It could be the sound of an infant’s crib-mobile slowed to an extreme. It could be the score to a planetarium installation, each newly introduced sound timed to the appearance of a star. Throughout, this undercurrent of tension, a tremulous if distant rumbling, is set against the glints that comprise the most prominent aspects of the composition. It’s quite a lovely thing, overall, in particular how the various different elements change how your ear perceives the work’s pacing. Hoist is Boston, Massachusetts”“based Charlie Hoistman.